If there were a prize for longevity in poker, Doyle Brunson would win it hands-down. Brunson, who is also known as the “Texas Dolly”, has spent 50-plus years in the game of poker. Interestingly enough though, Brunson seemed to be destined for a sports career long before taking the felt. Growing up in a town of just 100 people, the Longworth, Texas native often had to run to nearby towns so he could help out with errands. Brunson developed quite a bit of stamina and athleticism during his early days due to all of the running. The running paid off too because he went on to win the 1950 Texas Interscholastic Track one-mile race with a time of 4:43. He also starred on the basketball court, and achieved All-State honors. Universities from all over the United States sent Brunson scholarship offers, but he settled on attending Hardin-Simmons University in Abilene, Texas since it was not far from home. Athletic success continued for the Texan at Hardin-Simmons, and he even generated interest from the NBA’s Minneapolis Lakers. Unfortunately, Brunson suffered a horrific broken leg when a large amount of sheetrock landed on his leg during a summer job. This ended his basketball days, but opened the door for Brunson to play lots of Five Card Seven Card Stud. Laid-up with a broken leg, Doyle Brunson got a much better opportunity to play poker, which he had done sparsely before getting hurt. And his injury turned out to be a blessing in disguise since he quickly became successful in Draw poker. The Texas Dolly was so successful that he quit a machine salesman job he got right after college to keep playing poker. Brunson started playing wherever he could get action, and his travels took him to other states like Oklahoma and Louisiana. But Doyle had to be extremely careful because poker was not like it is today where grinders commonly play in games run by reputable casinos; instead, these poker games were run by criminals, and Brunson was robbed, beaten, and threatened many times. He would not have to settle for these circumstances forever though since he moved to Las Vegas in the 1970’s. 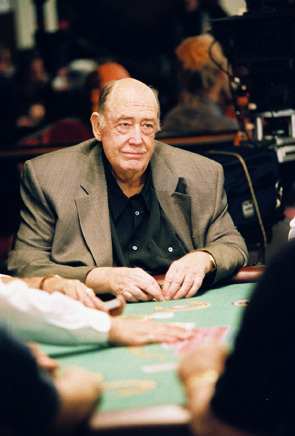 Doyle Brunson is one of the original attendees of the WSOP, having played in the event since 1970. After making several deep runs in the WSOP Main Event in the early 1970’s, he cemented his legacy by winning back-to-back Main Event titles in 1976 ($230,000) and 1977 ($340,000). Now the Main Event was not the same spectacle back in the 70’s as it is today – where thousands of players buy into the tournament. However, the $10,000 No Limit Championship was jam-packed with the world’s best players, and Brunson managed to trump elite 23-player and 34-player fields in two straight years. In addition to this, he also won a $5,000 Deuce-to-Seven Draw tournament in ‘76 and a $1,000 Seven Card Stud Split event in ‘77 for a total of four WSOP gold bracelets in two years. The 78-year-old is tied with Johnny Chan for second all-time with 10 WSOP gold bracelets. Fresh off his two Main Event victories, Doyle Brunson decided to capitalize on his success by writing Super/System. Released in 1978, this work is often hailed as the first great poker strategy book since it gave lots of insight into how professionals played. It was so good in fact that some pros were angry with Brunson for publishing the book. People who collaborated on Super/System with Brunson included Mike Caro, Bobby Baldwin, Chip Reese and David Sklansky. – Doyle Brunson has earned $6,103,712 in live poker tournament winnings. It is unlikely that he will add much to this total though because he does not do a whole lot of traveling outside of Las Vegas these days. – A regular in the high stakes poker games at the Aria and Bellagio, Brunson has won millions of dollars playing cash games. – The Texan has a World Poker Tour title on his resume since he won the 2004 WPT Legends of Poker tournament along with $1,198,260. – Shortly after Doyle married his late wife, Louise, doctors found what they deemed an incurable tumor in Brunson’s neck. After doing surgery to prolong his life for a few more years, doctors discovered that the cancer was miraculously gone. – Doyle has a son named Todd Brunson who is also a poker pro. Todd won a gold bracelet in a 2005 WSOP Omaha Hi-Lo event. – Doyle founded the online poker site DoylesRoom, which was bought and changed to AmericansCardRoom in 2011/2012.